University Of Iowa Press, 9781609384012, 84pp. 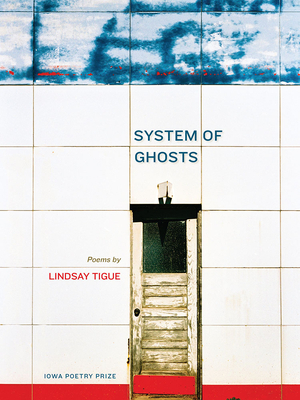 In System of Ghosts, Lindsay Tigue details the way landscape speaks to isolation and personhood, how virtual and lived networks alter experience. She questions how built environments structure lives, how we seek out information within these spaces, and, most fundamentally, how we love. Rooted in the personal, the speaker of this collection moves through society and history, with the aim of firmly placing herself within her own life and loss. Facts become an essential bridge between spatial and historical boundaries. She connects us to the disappearance of species, abandoned structures, and heartbreak—abandoned spaces that tap into the searing grief woven into society’s public places. There is solace in research, one system this collection uses to examine the isolation of contemporary life alongside personal, historical, and ecological loss. While her poems are intimate and personal, Tigue never turns away from the larger contexts within which we all live. System of Ghosts is, at its core, an act of reaching out—across time, space, history, and across the room. Lindsay Tigue grew up in Michigan. Her poems and stories have appeared in Prairie Schooner, Blackbird, Indiana Review, and Hayden’s Ferry Review, among other literary journals. She lives in Athens, Georgia, where she is a PhD student in creative writing at the University of Georgia. "Something powerful occupies these poems, even when a mournful air hangs heaviest over the collection, which makes this a truly solid debut."